Serve a creamy, cheesy and garlicky Hot Spinach Dip at your next party! 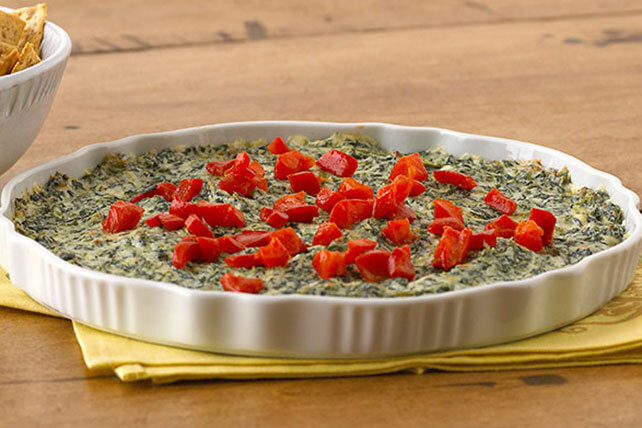 Our Hot Spinach Dip can be served hot from the oven in a pie plate or quiche dish. Heat oven to 350°F. Mix all ingredients. Bake 20 min. or until heated through. Serve with assorted crackers. Since this warm indulgent dip serves 16, it makes a great dip to serve at a party! Top with 2 Tbsp. chopped roasted red peppers before serving.